While waiting the new album, we have chance to see Hikashu among other new acts in February. 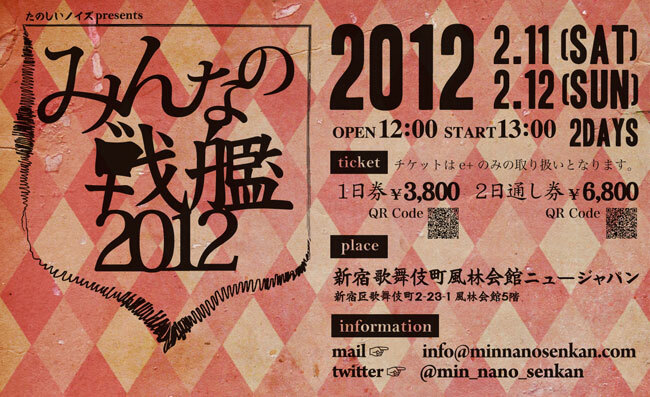 It's an event called "Minna No Senkan," [Everybody's Battleship] held on February 11-12 in Shinjuku, Tokyo. It's a sort of showcase gig, the 24 bands will appear. What interesting is that most of the bands booked are emerging, post-two-thousands musicians, and Hikashu is the only act from 1970s (or even 1980s). We think this means something. And the venue is also interesting - a cabaret called "New Japan" in Shinjuku. Cabaret used to be very popular and influential place for socializing in post-WWII Japan, but the culture dwindled after 1980s. Shinjuku New Japan was one of the most famous, and one of the few surviving spot today. Although now it is no longer a "cabaret," its facility is still intact and the atmosphere of the golden period is well-preserved. Experience the good old days of Showa retro at Shinjuku New Japan. 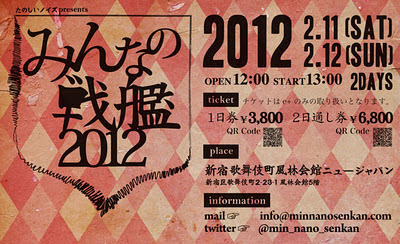 Note: Hikashu will perform on February 11 only. Their time-slot is 17:30-18:00. The cover of Hikashu's upcoming album will feature an artwork of Tabaimo, a young female artist who has been recognized internationally as a sensational new voice in contemporary art scene. Her English bio is here. Many of her work depict modern, daily life of ordinary Japanese, which is often tedious, mundane, and just plain boring. She makes such humdrum things into wonderful pieces of art. There is an interesting story regarding the origin of her name: "Tabaimo" is a childhood nickname endowed by the friends of her sisters (she is the middle of three sisters). "Taba" is a short of "Tabata," which is her family name, and "imo" means "younger sister." So she uses a nickname of tender years as artist name, which is a kind of unusual in the world of art, but it surely gave her some merit because that childlike name is very easy to remember in Japanese, regarding its pronounciation. Moreover, she gave one more twist: the selection of kanji characters. That is, she applied the unusual kanji characters to the name. She choose "束" [bundle] for "taba," and "芋" [potato] for "imo." So her artist name means "Bundled Potato." This selection is also childlike, and it even gives an impression of somewhat unrefined or unsophiscated, but that was probably her intention. She is now preparing the artwork for Hikashu. Let's look forward to the finished piece. "Hatsuimo," the first film document of her work, made in 2001. The release date of Hikashu's upcoming album, tentatively titled "Uragoe," is now set on April 8, 2012. Uragoe means "falsetto" in Japanese. The album was recorded at EastSide Studio NYC in May, 2011. It contains, at least, four compositions plus collective improvisation. Some of the tunes are already performed live regularly. "Uragoe," the title track, is a mid-tempo song features Makigami's adventurous vocals. "Fude o fure, Kanata-kun" [Wave the Brush, Kanata-kun] is a fast and fierce tune, and contains an extended interlude jam in 4/4. "Yuugata No Iesu" [The Affirmation of Evening] is also a long, dynamic tune with an impressive, dreamlike introduction played by Shimizu Kazuto. And "Umaretate No Hana" [A Newly Born Flower] is a solemn ballad. All the tunes are written during their NYC stay in last May, so everything is new. As far as we could tell, all the previewed songs are just great music with interesting lyrics, as always. In short, the material is unlike of their previous efforts, but the Hikashu-ness is still intact and well-preserved. All we could do is to support the unique, veteran band which daringly continues to seek new directions after 30+ years of its existence. Hurrah for Hikashu!